October 31, 2018 – Ethiopian Defense Minister Engineer Ayisha Mohammed said her army is closely following activities of armed groups in Qelem Wollega of Oromia regional state of western Ethiopia. Her remark followed reports of large rallies across western Oromia, supporting the Oromo Liberation Front (OLF) and rejecting the government’s plans in Addis Ababa to disband OLF troops. The rallies involved skirmishes and roadblocks, stemming partly from uncertainty over an agreement the recently returned OLF made with the government. “It is true that armed groups are roaming around Wolega city and surrounding areas of western Ethiopia. Their activities have put security of the public in danger. They are of course under the surveillance of our defense forces.” the newly appointed defence minister said in a briefing on Wednesday. 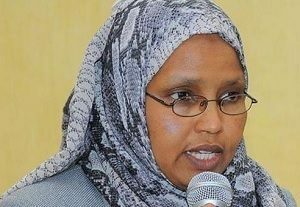 Ayisha said the government will not tolerate such illegal activities and will take measures to defend the constitution and public security. On October 26 and 27, rallies were reportedly held against potential disarming of the OLF by Ethiopian defense forces in and around 15 towns, including Ambo, Nekemte, and Dembi Dollo.